Patrick Schwarzenegger, a part-time model, was hurt in Sun Valley, Idaho. 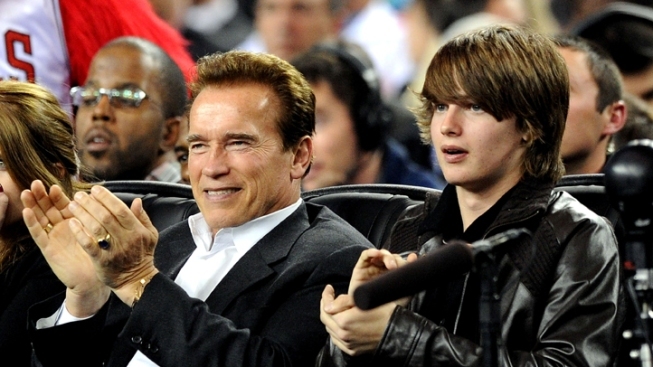 Hollywood icon and former Governor of California Arnold Schwarzenegger and son Patrick at a basketball game in 2010. The 18-year-old son of Arnold Schwarzenegger and Maria Shriver says he has been treated for injuries after getting in "a little ski accident" in Idaho. Patrick Schwarzenegger tweeted Saturday that he received stitches "down the back and but" (sic) after the accident, and he also thanked doctors who he said cared for him in Sun Valley. He provided a link to a photo he posted to the social networking application Instagram, showing a deep cut on his lower back. He also said that he had been bruised in the accident, but did not provide details on how he got injured. A request for further details late Saturday from Shriver's spokesman was not immediately returned. In 2006, Arnold Schwarzenegger broke his leg in a ski accident at Sun Valley while he was governor of California.